Why Grow Your Own Pumpkins? Besides better taste, better nutrition, lack of herbicides/pesticides/fungicides, and absence of chemical treatments to prolong storage life and/or hasten ripening, there is still economic value in growing your own vegies. Pumpkins (squash to North Americans) are one of my favourite crops, simply because they don’t ask anything of you for the whole growing season. If you start them in a nice patch of nutrient-rich compost, you won’t need to revisit them until picking time! All 13 of the pumpkins below (plus a 14th that we ate a couple of weeks ago) came from a couple of vines that self-seeded out of a pile of compost. I weighed one of the average-sized pumpkins, and it was 6 kg. So 14 pumpkins add up to about 84 kg. This type of pumpkin is currently selling in the supermarket for $2.49/kg (I’m using commercial produce prices, not the higher organic prices). So that was over $200 worth of pumpkins that just popped up out of the dirt by themselves and waited for us to pick them! These will last us for months, making lots of beautiful soups, stews and roasts through the winter. Other low-effort crops I love include sweet potatoes, snow peas, climbing beans, sugar-snap peas, cherry tomatoes, chokoes, potatoes, Jerusalem artichokes and rhubarb, plus herbs like bay, parsley, mint and rosemary. They all seem to thrive without any need for care from sowing right through to harvest. Some even cut out the sowing step for me, and propagate themselves! What are your favourite low-effort/high-payback crops? Pumpkins are certainly one veggie that makes sense to grow for anyone wanting to save $$$. They can take up a lot of room, but even a smallish area can produce a lot of pumpkins. We don’t have a big back yard but always grow a plant or two. This year’s pumpkin crop was the worst we’ve had. At best we may have harvested 10. In previous years we’ve had between 40 and 80 giving us plenty to share around with “willing” friends and workmates. @Tim: Yep, space is one thing that pumpkins need. Since they don’t need much care, though, you can put them right down at the end of the yard out of the way. Did you have a very wet year like we did? That can knock the crop back a lot. Pumpkins are an excellent barter item! Can all those pumpkins really last for months? Any advice on how to store them? I am currently looking into growing veggies myself (going to start this spring)but thinking I will start with herbs first. 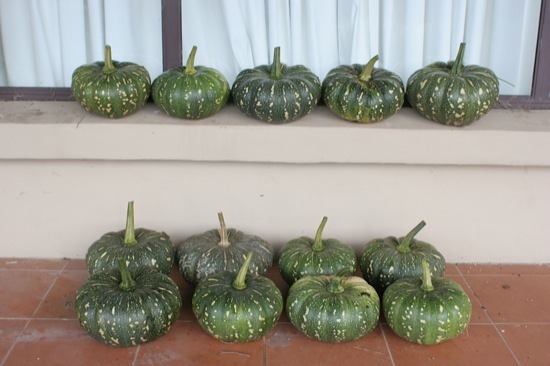 @GreenerMe: Depending upon the variety, pumpkins can be stored for 6-12 months! You do need to store them properly, though – I’ll write a follow-up post on that. Starting with herbs is very smart – they don’t take up much room and are very expensive to buy from shops. Plus, the ones you buy aren’t anywhere near as fresh as herbs picked straight from the garden. They also give a continuous harvest, and you don’t need to pick them until you’re ready to use them. Excess can be easily given away or dehydrated for storage. Yes we had a very wet year. The previous four had been very dry when 5mm of rain would have been seen as a good rainfall. Don’t harvest them until their stalks have dried up (or at least cut a good length of stalk still attached to the pumpkin). They also need to be protected from frost. Exposure to frost before harvest will reduce their storability. @Tim: Thanks for the storage tips. I’ll do a post on storage soon. I thought we had harvested all the pumpkins from this year’s vines, but this afternoon I found another one on the roof of the back garden shed – the choko has died off in the cold and the pumpkin had climbed up the choko stalks and spread all over the shed roof. I’ll be trying to replicate this next year by deliberately planting some pumpkins seeds next to the choko’s climbing frame – saves a lot of space to grow tough things on the shed roof! @Liesel: Yeah, I love it when you find a bonus one! Just today I found a butternut pumpkin underneath a bush – my wife had trimmed the hedges this week and must have cut the pumpkin vine without realising there was a pumpkin up in the bush. Good idea to team up the chokoes and pumpkins!